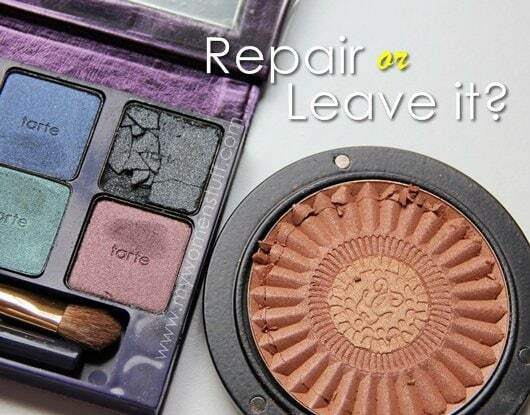 Home » Interesting Discussions » Your Say: Do you repair or re-press broken powder makeup? Your Say: Do you repair or re-press broken powder makeup? Fortunately, it did not shatter so its still useable. I just have to be careful storing it. However, I’ve had powder makeup shatter on me before and always, I’ve been advised to re-press or repair it where it can look as good as new. Sort of. However, I don’t do this. Repairing or re-pressing broken powder makeup requires rubbing alcohol or isopropyl alcohol, which I believe can be obtained from most pharmacies. It is commonly used as a disinfectant. To repair broken powder makeup, what you are advised to do is drip some rubbing alcohol onto the shattered powder, press it back together with a spoon or spatula, re-emboss it if you like, and then leave it for a few days to dry out properly before using. Isopropyl Alcohol evaporates quickly without changing the colour of your makeup hence the common use of this for repairing broken eyeshadows or blush or for pressing loose powder eyeshadows or pigments. I have done this before many years ago when I first learned about this. The colour does not change, but I found the texture was different. What was once a product where I could pick up pigment or colour easily became harder to the touch and to work with. I did not like that. I therefore choose not to use this method. In fact, I choose not to repair the shattered item. If the item is old, I sometimes toss it as I did my Nars Desire blush that broke while I was depotting it. Sometimes, I toss out the broken bits and work with the remaining product (as I did the Dior Cannage palette). If I absolutely love the color then I crush it up, put it in a empty tub and use it as a loose powder eyeshadow or blush. If its broken but not shattered, I leave it where it is and use it more carefully, as you see in the picture above. Its my personal choice. Your say: Do you repair or re-press broken powder makeup? Or do you just give up on it? I repressed once. But usually I just crush the product and store it in a jar. I’m too lazy to repress lol. These days though I try to be very careful with my makeup but I still broke something every now and then. I’m just very clumsy lol. We all have accidents Gio! 😀 I prefer to just crush it up most of the time… unless its a lipstick then I usually toss because I hate the whole melting down process. Don’t trust repressing with alcohol or with any other liquid. If it’s an old thing/easily available and not too expensive, i’ll bin it. But if it’s fairly new or something that’s already discontinued and is a ‘big love’, like my very, very, very old Anna Sui Eye Brow Powder, I’ll continue to use it. Looks like so many of us take the easy (safe) way out by either continuing to use it or repotting it and using it as a powder instead of repairing it with alcohol as so many people have advised. I find that most intriguing! never happened to me before. guess i’m lucky. but my bed room is carpeted, so i doubt anything will break. I just continue to use the product if possible and when it isn’t, i crush it up into powder to use. Just depends on how shattered the product is. No, it has never occurred to me to even try to repair such things. Used to make me quite upset to see the shattered pieces though, nowadays it’s just a shrug and moving on. My heart sank when I saw the picture of your broken bronzer above. I usually toss the broken pieces and continue using it, eventually (after several uses) the flaw seem less visible. I leave it as it is, i dont want any chances to change the texture, smell by adding alcohol..
What more heart pain is , if the beautiful casing crack.. (especially those LE one) cos totally cannot repair it.. I have lots of luck with packaging so perhaps there’s some need for good sturdy packaging after all 😉 Usually the high end products don’t crack or chip etc but my cheap ones do tend to crack or have hinges break. I use Artistry make up and if it’s broken, I can always exchange a new one. Recently my Artistry liquid foundation pump didn’t work and I brought it back to Amway after sales center. They actually changed for me a totally new one! Surprised! The old one left 20%. I got my Tarte palette from a friend in the States last year. They are lovely but a little soft hence one shattered on its way here despite being very well bubble wrapped.